The monsoon has finally arrived but the low offtake of fertilisers, particularly urea because of the prolonged dry spell, continues to be a matter of concern to the state.Till June 30, about 10,000 tonnes of fertiliser had been lifted by farmers as against the normal 30,000 to 35,000 tonnes. In all, about 65,000 tonnes of fertiliser is used during the kharif season, of which 80 per cent is utilised in June and July. Renowned poet-lyricist Gulzar has expressed concern over the overwhelming influence of cinema on various aspects of life and underlined the need to protect the culture from its effects. It is after a long hiatus of 25 years that Sanjana Kapoor, an eminent theatre personality, has returned to restore ties with the historic Gaiety Theatre where her grandparents Prithviraj Kapoor and Geoffrey and Laura Kendall have given several scintillating performances. Many officials of the Department of Irrigation and Public Health (IPH) are coming forward to become approvers in the grease scam. As the vigilance is summoning officials of the department in the scam, more and more of them are willing to become approvers. IPH Minister Ravinder Ravi gave this information while talking to The Tribune here today. Patients in emergency will be provided free treatment at the local Indira Gandhi Medical College (IGMC) hospital for the first 24 hours.The decision was taken by the governing body of the Rogi Kalyan Samiti (RKS) of the IGMC and associated hospitals of Shimla which met here recently under the chairmanship of Health Minister Rajiv Bindal. House owners, who have been left in the lurch due to the alleged failure of the Municipal Corporation (MC) in undertaking timely disposal of cases under the retention policy, are likely to be given more time by extending the last date of June 30 for the disposal of all such cases. Peeved at the ousting of PTA teachers with a “political vendetta”, hundreds of PTA teachers of the district today held an anti-government demonstration and raised slogans against Chief Minister PK Dhumal, Education Minister ID Dhiman and the state government. They demanded that they should either oust all 15,000 PTA teachers in one notification or touch none. Resenting the autocratic style of functioning of the Vice-Chancellor, the executive council (EC) and university court members of Himachal Pradesh University (HPU) threatened to launch an agitation in case the genuine demands of the employees were not met. In a bizarre incident, two unidentified youths hired a taxi from Kangra market on Tuesday evening for Udhampur in Jammu and Kashmir but on reaching near Lakhanpur, they allegedly assaulted the driver and fled with the car. The government today ordered the posting and transfer of four IAS and 14 HAS officers.Padam Singh Chauhan, presently DC, Una, has been transferred to Sirmaur and KR Bharti, Special Secretary (GAD) has been posted as DC, Una, in his place. Dhruv Vashisht, Additional Director, Industries, has been posted as Director, Transport. Bus drivers having an accident-free record will be rewarded with gold and silver medals by the management of the state road transport corporation. This was stated by transport minister Kishan Kapoor while addressing the first meeting of new board of directors of the corporation here yesterday. He said the gold medal would carry a cash award of Rs 21,000 and silver medal Rs 11,000 to encourage safe driving. Senior citizens’ forum president, Dharamsala, RL Mahajan had written to the Chief Justice of the Himachal High Court in March to expedite proceeding in cases relating to senior citizens, who are above 65 years. Following this, the Register (Vigilance), Himachal High Court, has stated in reply that instructions in this regard had been passed to state judicial officers. A two-day workshop on Right to Information Act held for information and assistant information officers concluded here today in which deputy commissioner, Hamirpur, Abhishek Jain asked information officers to display their name plates outside their offices. The Jawali police today arrested Balbir Singh of Sunet village, near Fatehpur, for allegedly killing his mother Parkasho Devi (70) when she was sitting with one of her younger sons at his residence last night. The government has admitted that computerisation in the Income Tax Department has had little impact on the efficiency of the department. In response to a query made under the Right to Information Act, the Finance Ministry has revealed that the department was forced to pay a whopping Rs 13,159 crore by way of interest payment in just three years, all because the department delayed refunds to assessees. The monsoon has finally arrived but the low offtake of fertilisers, particularly urea because of the prolonged dry spell, continues to be a matter of concern to the state. Till June 30, about 10,000 tonnes of fertiliser had been lifted by farmers as against the normal 30,000 to 35,000 tonnes. In all, about 65,000 tonnes of fertiliser is used during the kharif season, of which 80 per cent is utilised in June and July. Stores of Himfed and Iffco are full to the capacity. Cooperative societies and farmers are expected to lift stocks as the demand will increase following the rains. However, the overall consumption will be less than normal. The director of agriculture, JC Rana, said over 2.96 lakh hectares of land was planted with maize during the current season, of which 45,000 to 55,000 hectares had been affected. Bilaspur, Hamirpur, changer areas of Kangra and Sirmour, where sowing was completed by the first week of June, had been the worst-hit. In case there was no germination by the first week of July, farmers would have to go for re-sowing of maize or an alternative crop, he added.The department had advised them to plant pulses like Moong or even fodder crops like bazra and chari as these crops matured within three months and are ready for harvesting by September-end. Inaugurating a two-day seminar on “Narrating and translating women’s cultural heritage in Chamba” at the Indian Institute of Advanced Study here today, he said Hindi film music was posing a threat to folk songs and “remix music culture” was “vandalising” old melodies. He said bollywood actors and singers were star performers at all major events be it a sports tournament or other functions. He recalled his recent visit to the remote tribal area of Bharmour in Chamba when tribal “gaddi” singers followed each traditional folk song with a bollywood number to impress him. He felt disappointed with Chamba town where traditions had been relatively well-preserved and noticed signs indicating erosion of culture all over the place. The aim of the seminar is to focus on the need to preserve the rich cultural heritage of Chamba town. He lamented that most of the books and other material available on Chamba did not provide any insight into the life, culture and creativity of the people as these were written either by district collectors or other senior officers, who focused more on statistical data. Director of the institute Peter d’Souza said he readily agreed to collaborate with the Sahitya Academy, New Delhi, for organising the seminar as he wanted the institute to be a part of the intellectual and cultural life of the state, which was rich in oral resources. Convener of the seminar Malashri Lal from Delhi University said there was need to develop a conceptual and theoretical framework for working on “orality” in the country in view of its multi-cultural and multi-layered society. Gulzar was also felicitated at a public function organised by the institute to honour him on wining the Oscar Award for his song “Jai Ho”. It is after a long hiatus of 25 years that Sanjana Kapoor, an eminent theatre personality, has returned to restore ties with the historic Gaiety Theatre where her grandparents Prithviraj Kapoor and Geoffrey and Laura Kendall have given several scintillating performances. As a young girl she managed the stage and sound while her grandparents Kendall’s performed “Old World” at the historic Gaiety Theatre way back in 1984. “I remember the old theatre vividly and I would love to get associated with the place once again,” she said. She is managing the Prithvi Theatre Group and is actively involved with the launch of the Indian Theatre Forum. Despite her visit to the place after such a long period, she has kept account of the restoration of the Gaiety Theatre while being back home in Mumbai. “It is out of sheer curiosity that I came here, but I will be glad to have summer programme for children or even part of our winter festival here,” she said. Even though she terms television as the biggest culprit for churning out rubbish, she feels the audience too is getting fed up. “There is not one programme worth watching on any television channel and I am glad that people are gradually returning to their three hour of “paisa vasool” through theatre,” she said with a glint of optimism in her eyes. She, however, hastens to add that television was undoubtedly the most powerful medium, but unfortunately we have been absolutely abusive of it. The excitement over the visit of Sanjana Kapoor who has lived up to her legendary lineage was palpable as theatre artists gathered to seek her guidance and association with her work and group. “The place has been done up really beautifully, but we need to breathe life into it ensuring that the ambiance and ethos of the place is kept intact,” she added. 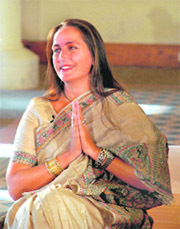 With her grandparents and parents Shashi and Jennifer Kapoor having performed at the Gaiety Theatre, she not only had fond memories of the place, but also shares a special emotional bond with the theatre, which she hopes to take further by having a connection with the place her family has been associated with. When asked about the progress in the case, the minister said an executive engineer of the IPH Department, who was the main accused in the case, had already given his written statement to the Vigilance Department. In the statement, he had stated that he was under tremendous pressure from former IPH minister and HPCC president Kaul Singh to execute the objectionable works. He said the government is committed to bring all guilty in the grease scam to the book. The scam in which grease was purchased at exorbitant cost of prices ranging from Rs 990 to Rs 9,990 per kg had shocked many in the state. In some of the cases, the grease was purchased from a welder in Shimla. The cotton that was to be used for gagging in pipe of the IPH Department was purchased at prices ranging up to Rs 300 per kg. Besides, all purchases were made on the same day and payments were also made on the same day. The BJP had been making the grease scam an election issue during the last Lok Sabha elections. With the name of the HPCC president being dragged into the scam after the statements of IPH officials, the issue might again gather political heat. HPCC president Kaul Singh said Ravinder Ravi was pressurising employees of his department of give statements against him. He said the executive engineer, who is the main accused in the case, could not become approver as per the law. The executive engineer has done everything on his own. In addition to that, in an affidavit submitted against him the executive engineer has given wrong names of companies. No material was purchased from the said companies, Kaul Singh added. He further added that he would produce the entire record in the case at an appropriate time. Patients in emergency will be provided free treatment at the local Indira Gandhi Medical College (IGMC) hospital for the first 24 hours. The decision was taken by the governing body of the Rogi Kalyan Samiti (RKS) of the IGMC and associated hospitals of Shimla which met here recently under the chairmanship of Health Minister Rajiv Bindal. During this period, all routine investigations, procedures and medical items available will be provided by the hospital authorities free of cost and patients will be charged after they are shifted to the wards as per prescribed rates. The government had filled 250 posts of nurse out of which 127 nurses had been posted at the IGMC, Shimla. In addition, 150 more posts of nurse were proposed to be filled shortly out of which 40 nurses would be posted at the IGMC. The state government will also introduce free ambulance service in the state available through a toll-free number. The samiti plans to set up 64 Slide CT Scan facility at the IGMC and efforts were to bring the IGMC and Kamla Nehru Hospital under one roof. Several house owners here were unable to fulfil objections received from the MC on June 29, as the last date for the disposal of cases was June 30. On their request, the matter is likely to be placed before the Cabinet so that they can be granted more two to three months to fulfil objections being raised by the MC. The MC had received about 1,000 cases under the retention policy for the regularisation of structures that have been raised in the violation of the norms. It was to give relief to such house owners that the government had come out with the retention policy that allowed 40 per cent deviation. Despite house owners filing their applications for the regularisation with all the relevant documents with the MC, it was only a day or two before June 30 that they received the objections. “With the letter pointing out an objection being delivered to me on June 29, it was impossible for me to remove this and return it to the MC before June, 30,” said an aggrieved person. The objections involved changes in design maps of the building that required spot visit and consultation with an architect or in some cases breaking of certain structures that have been raised in the violation of the norms. Sources in the MC said with certain issues not too clear in the retention policy, the dealing staff were unable to handle and dispose of the case on time. Officials admitted that due to delay on the part of the MC, the people were left with a little time to fulfil the objections raised. The last date for the filing of applications before the architect planner, MC, was March 31 and objections made had to be removed by June 30 for the final disposal or rejection of cases. There was, however, delay in timely disposal of the cases as the task was assigned to the building and road (B and R) offices of the MC and not to the three offices of the assistant planners. The PTA teachers converged on the local municipal stadium here after the school hours and held demonstration, raising slogans against Dhumal, Dhiman and the government. District-level PTA president Rajesh Bhatia and state vice-president of the PTA Teachers Association Rajeev Choudary said the state government held inquires at least five times into the appointment of PTA teachers and some were “victimised” under the political pressure and rest were declared ineligible for the posts of teacher. They alleged that the Chief Minister had assured them of appointing PTA teachers on contractual basis to pave the way for their regularisation, but the state government started ousting them selectively. PTA leaders said recently TGTs were promoted as lecturers against working PTA lecturers thus showing the door to 110 PTA lecturers. They alleged that the government regularised voluntary teachers far less qualified than PTA teachers, but was adamant to oust well-qualified postgraduate trained teachers for no fault of theirs. They demanded that the Chief Minister should look into the matter and demanded that the government should stop selective ousters of the PTA teachers.They said if the state government was reluctant to accept their demands then they would fight for their rights. In a statement issued here today, Waryam Singh Bains, member of the EC and the university court, and Birma Chauhan, member of the university court, lashed out at the VC Sunil Kumar Gupta for not taking them into confidence. “We are the duly elected members of the highest decision making bodies of the HPU, but we were not called for discussions,” said Bains. He said the letters listing the priorities had already been submitted to the Chief Minister, VC and Registrar. “Despite this the VC has not been able to spare time to either talk to us or take decision on important matters like pay fixation disputes,” he said. Seeking the intervention of Governor Prabha Rau, who is the Chancellor of the HPU, he said in case the VC shows disregard towards elected members a save university campaign would be launched by holding dharnas and demonstrations. Kangra Subdivisional Police Officer Jeet Singh Thakur said Harbans Lal of Neatherd village alleged in his complaint that two unidentified youths hired an Alto car (HP40B-0954) for Udhampur around 7 pm on Tuesday. However, the driver of the car, Ajay Kumar, was assaulted on the midway and was thrown out of the car, the complainant added. Later, the duo fled away with the car. The Punjab police has registered a case in this connection. The DSP added that investigations were on and the Kangra police was in touch with the Punjab police, which has registered a case in this regard. The government today ordered the posting and transfer of four IAS and 14 HAS officers. Padam Singh Chauhan, presently DC, Una, has been transferred to Sirmaur and KR Bharti, Special Secretary (GAD) has been posted as DC, Una, in his place. Dhruv Vashisht, Additional Director, Industries, has been posted as Director, Transport. JR Katwal, Director, Ayurveda, has been given charge of Special Secretary (GAD) and Director, Youth Services and Sports. He will continue to hold charge of Ayurveda. Rakesh K. Sharma, Land Acquisition Officer (LAO), Chamera, has been posted as Additional Director, Industries. Vikas Labroo, Additional Director, Urban Development, has been posted as Settlement Officer, Kangra. Urmil Gyan Bharti, Additional Secretary (Education), will hold the same post at Himachal Institute of Public Administration (HIPA). Rakesh Sharma, SDM, Una, as SDM, Dehra. Pradeep Kumar Thakur, SDM, Kangra as SDM, Una. Layak Ram Negi, SDM, Dehra, as SDM, Kangra. Additional charge has been given to four IAS officers. In the letter, it has also been stated that all judicial officers have been directed to expedite cases pertaining to senior citizens and not to grant unnecessary adjournments in their cases. Mahajan said senior citizens, who were above 65 years, constituted 7 per cent of the litigations pending in various courts across the country. Most of these cases were related to property, inheritance and landlord-tenant disputes. He said they had requested the Chief Justice to get these cases decided on priority basis. He said officers should bring transparency in their working and keep their record in proper order so that any information desired by people could be supplied on time. Jain said all panchayats and block development officers had been supplied literature to make people aware about this law. RTI activist, Dev Ashish Bhattacharya wanted to know from the ministry the amount of interest paid on account of delay in refunds and whether anyone had been held responsible for it.In his reply, Public Information Officer and Deputy Secretary, Finance, J P Chandrakar, informed Bhattacharya that the department does not maintain separate accounts or details of the interest paid on delayed refunds. However, the ministry fortunately did have the consolidated figure of the total interest payment made by the Income Tax Department for the years 2003-04, 2004-05 and 2005-06. As much as Rs 4,701 crore was paid as interest in 2003-04 during the NDA government at the Centre. Next year, the amount declined to Rs 3,865 crore when the UPA government took over. But in 2005-06, the figure went up to Rs 4,553 crore. Bhattacharya suspects that there is a distinct possibility that much of this is being done deliberately and in connivance with officials. But this can only be established if the government reveals the identity of corporate bodies or individuals who have been paid interest in excess of one crore Rupees. But the ministry does not appear to be inclined to share this information and it has already tried to hedge it by declaring that separate details are not maintained at all. He further stated that granting refund to assesses consequent to the assessment in accordance with the provisions of the Income Tax Act was a continuous process. Interest on refund was normally admissible from April 1 of the assessment year.Regarding accountability for the delay, he informed that the concerned jurisdictional assessment officer was responsible for timely refund to the assesses. Interest was granted on refund in accordance with Section 244(A) of the Income Tax Act (1961).